Coding at a History Museum? 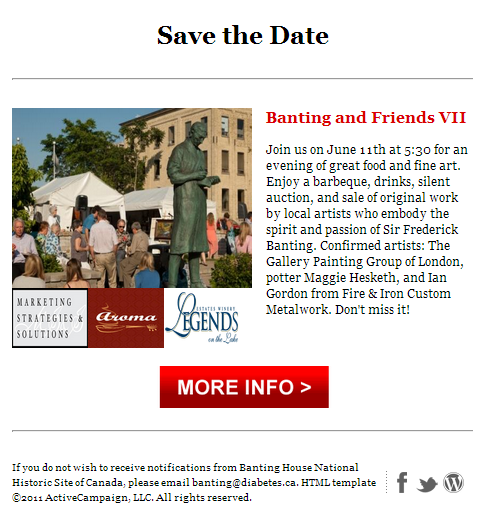 Banting House National Historic Site of Canada has started to prepare for the upcoming Banting and Friends VII event which will take place on Thursday, June 11. Banting & Friends is the sole fundraising event at Banting House, and thanks to our generous sponsors, it is also an opportunity for local artists to showcase their work in the place where Sir Frederick began his painting. There are many different things that go into hosting a successful event including letting people know that it’s happening through social media and electronic invitations (evites); it’s impossible to run a great event if there are no people! To start publicizing Banting & Friends VII we created an event page on Facebook where there will be updates on the featured artists and other event details. I was also busy adjusting the “Save the Date” evite this week, which required a little bit of coding. Coding is not the first thing that comes to mind when I think of a history museum. My knowledge of coding languages (such as HTML and CSS) was limited to what I had learned in an introductory Computer Science course a few years ago, which made working with the code challenging. Luckily the Graduate Research Assistant from last year, Stacey Devlin, had left a great explanation on the code she had created. (Using Google is also really helpful for finding coding shortcuts!) I took the source code from the invitation Stacey made and copied it into a Notepad document so I could save it as a functional HTML file. This meant that when the evite was sent out, you could actually click on the button and it would link you to the Facebook event page. 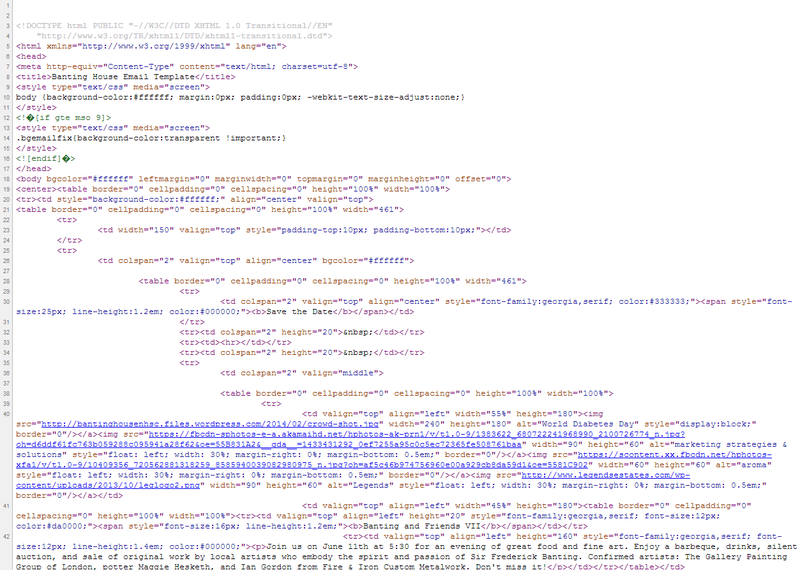 This is what part of the source code looked like that went into the “Save the Date” invitation. An image of the “Save the Date” created by the code. It looks a lot nicer than the rows of text above! After a few hours of struggling to adjust images and change fonts, the invitation was looking refreshed and was ready to send out. The only problem was taking the file I had updated and figuring out how to insert it into an email properly. With a quick phone call, it was Stacey to the rescue and she was able to tell us how to get the evite into an email without losing any of the formatting or functionality of the links inside it. Updating the evite for Banting & Friends reminded me of how important it is to work things through and not get frustrated when something isn’t successful right away. Learning how to code may not seem like an obvious thing to do when you study history, but you never know when it might come in handy! Manipulating the code gave me a better understanding of how it was written and what the different lines controlled. Yes, it took me significantly longer to edit the code than it would have for someone with a good grasp of HTML and CSS, but eventually it worked out. It also shows how tight-knit the museum community can be; Stacey was ready to help out without a moment’s notice which definitely sped up the process. For more information on Banting and Friends VII and to stay up to date on the artists that will be featured alongside some fine cuisine, take a look at the Facebook event page over the next couple of months. We hope to see you there! Posted in Uncategorized.Tagged Banting & Friends, Banting House NHSC, Sir frederick.